I recently joined the Facebook Group British Books whose members talk about their writng and post photos of places in the UK they have used as settings for their novels. It’s a lovely opportunity for a glimpse into the world of other writers to see what inspires them. Every novel needs a setting, whether it’s coast, countryside, town or cityscape and what better way to do this than to use places you are familiar with? Today my post is going to be about one such place, but not only is it a where there’s a who involved as well..
My first full length commercial novel was set to be just that; one book. However once the writing got underway the whole thing simply took off. When Tomorrow Comes finally expanded into Love Lies and Promises and The Ghost of You and Me – a trilogy based in the West Country in the late sixties/early seventies. The story followed the on-off relationship between star crossed lovers Ella Kendrick and Matt Benedict. At the start of the story twenty year old Matt, a gifted song writer, was part of a rock band who eventually found fame, taking him away from the provincial town he and Ella had grown up in. Part of Matt’s gift was in the genes – his father Tad Benedict had been a well-known singer in the 1950s, a pragmatic businessman who had used the money from his success to give him an alternative career once his singing days were over. As well as owning a string of small hotels he purchased local run down riverside tea gardens and converted them into a club – The Mill,. This became a social hub where the emerging 1960s youth culture came to drink and dance. So was this something which I conjured up entirely from my imagination? No, far from it. A venue similar to The Mill did actually exist and the inspiration for Tad was based on the man who ran it. 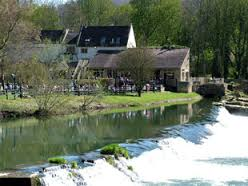 Keith Johnson, a Bath entrepreneur bought the Weir Tea Rooms in Bathampton on the eastern edge of the city in 1962. He converted the old riverside building and The Keel Club was born. At that time the only way the emerging youth culture could listen publicly to music was through live bands. Playing recorded music was almost unheard of but Keith changed all that. Starting out with the 12 records he had in his possession he extended the collection, playing the latest chart sounds and adding a weekly promotional slot for live bands. He was said to be the pioneer for shadow dancing, where two girls danced on stage silhouetted behind a lighted screen. His dancers also introduced him to a group of Bristol students who were developing some quite innovative lighting techniques which could be used in the club. Spotted by a man from the ‘Beeb’ they eventually went on to work on lighting for the BBC’s prime time chart show Top of the Pops. In 1967 Thin Lizzy played their very first gig at the club, an event which nearly ended in disaster. Keith’s advertisement for the band’s appearance was picked up by Bath Council’s Watch Committee. He was contacted and told if Thin Lizzy appeared he risked having his licence revoked. Why all the fuss? Because the Committee had it in their heads it was the name of a striptease artist! Annual membership was £5 a year and at its height of popularity the club had 16,000 members.. This was a totally unique venue, there was nothing like for miles and it pulled in people from all over the West Country. By the early seventies the generation who had flocked there a decade before had moved on. They were married with mortgages and babies on the way, no longer having either the inclination or disposable income to visit the club. The new up and coming late teenage/twenty somethings had different tastes and demands on their pockets too. Membership waned and Keith finally closed the club in 1974. He reopened it shortly afterward as The Skanda a restaurant offering genuine Scandinavian smorgasbord to its diners. I followed a similar pathway to this in The Ghost of You and Me where Tad closes The Mill and reopens it as a dinner/dance club called Zefferelli’s. In 1984 Keith sold out to one of the big breweries who did a complete refurbishment adding it to their Beefeater steak chain. 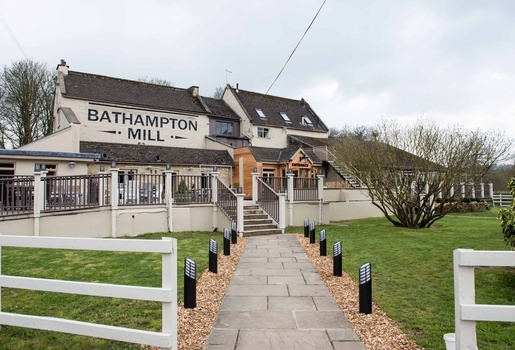 Today it’s still an eatery only now it goes under the name of The Bathampton Mill. In 1994 Keith moved into up market bed and breakfast, converting part of his own home to start this new venture. That was when I actually got to meet him. I was working for an international training college at the time and we were always looking for new local places out of the city to accommodate visitors. He showed me around we had coffee and he talked about those amazing times when he ran The Keel Club. Sadly he’s no longer with us but local people who remember him do so with great respect; he lives on in local musical folklore. He was definitely a visionary; a man ahead of his time and of course I’m indebted to him too because without Keith Johnson there would have been no Tad Benedict. 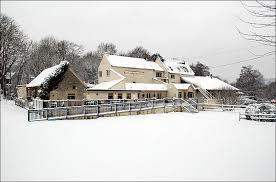 British Books’ current group topic is Christmas and I guess although I’m not contributing directly to this having a shot of Bathampton Mill in the snow does go someway to embracing the theme! My husband is Keith Johnson’s son. I never met Keith but heard about all of his stories. This is lovely to come across this. Thank you. I wasn’t a local during that time but my husband and his friends were Bath boys and club members. He remembers those days with great affection and ‘the boys’ have a regular get together once a year for a lunchtime drink and to watch football afterwards.